King Hiram Royal Black Preceptory No. 762 was a Protestant fraternal organization in North Bay, Ontario. The Preceptory was founded on June 30, 1909 and named after the biblical Hebrew King Hiram I. It is unknown when the Preceptory was disbanded, but it was likely around 1994. The Royal Black Institution, to which the Preceptory belonged, is closely affiliated with the Loyal Orange Institution and only Orangemen are eligible for initiation as members. Like the Orange Order, the Royal Black Institution was founded in Northern Ireland in the late 18th century during a period of Protestant-Catholic sectarian conflict, and has a Masonic-style organizational structure and system of degrees. Fonds reflects the administration of King Hiram Royal Black Preceptory No. 762, particularly its meetings, membership, and finances. Records are arranged into three series: Attendance books; Finances and membership; and Minute books. The fonds also contains records that are not part of any series, including two photographs, lists of preceptors, and annual returns. The image linked to this description (ON00408 F018-0003-06.jpg) is titled : R[ight] W[orshipful] Bro[ther] Dr. C. Miller, Grand Master of Prov[incial] G[rand] B[lack] C[hapter] - Ontario West - R[ight] W[orshipful] Bro[ther] B. G. Gosse, Grand Organizer - Ontario West. 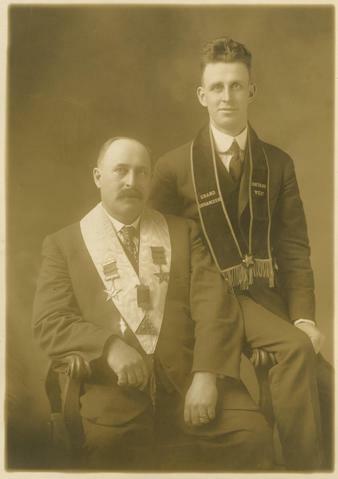 The photograph's date of creation is 1922 or 1923, and it is <a href="http://archives.eclibrary.ca/r-ight-w-orshipful-bro-ther-dr-c-miller-grant-master-of-prov-incial-g-rand-b-lack-c-hapter-ontario-west-r-ight-w-orshipful-bro-ther-b-g-gosse-grand-organizer-ontario-west" target="_blank">item 0003-06</a>. Dr. C. Miller was Preceptor of King Hiram Royal Black Preceptory No. 762 from 1911 to 1913.